The Babysitter is available in its original pastel format, mounted and framed in the highest quality materials, and also as Signed Limited Edition prints in 2 sizes. These can be purchased below. 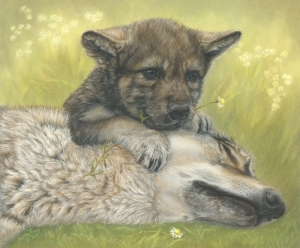 A percentage of net proceeds from sale of prints will be donated to The UK Wolf Conservation Trust. Read more about the painting by clicking here. To purchase the original pastel painting please contact Anita directly on 07813 536463 or via the Contact Me page. Signed Limited Edition prints of The Babysitter are available in 2 sizes printed on archival-quality fine art paper. Prints can also be supplied mounted.